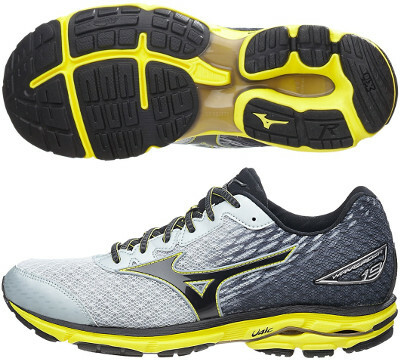 Mizuno Wave Rider 19 are neutral cushioned running shoes. The popular Mizuno Wave Rider 19 is definitely the flagship of the japanese brand and it seems that japanese product managers are reluctant to major changes because this edition has not many changes from the previous Wave Rider 18. Initially intended for neutral runners, it is stable enough to provide mild pronation support which is a big advantage when fatigue shows up in long runs. No big changes in the upper of the Wave Rider 19, just remarkable an improved breathable AIRmesh for enhanced durability with stitched overlays as Mizuno logo to provide reinforced structure. Not many reflective elements compared to its counterparts so take it into account when running under poor light conditions. Midsole features a cushioned but responsive ride combining specific shock absorbing SR Touch with well known Wave® technology in the heel to dissipate impact forces away when landing, offering a more reactive response. Outsole is exactly the same as in the Wave Rider 18 with harder and more durable carbon rubber (X-10) in the heel and blown rubber in the forefoot for more softness. Mizuno includes Smooth Ride™ technology to define grooves depending on gender for a more fluid transition.